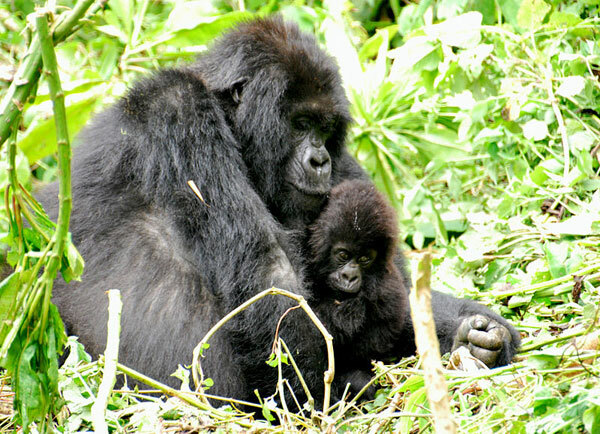 Mountain gorillas (Gorilla gorilla beringei) are large, quiet, gentle apes that live in Africa. Although gorillas are frequently portrayed as aggressive, dangerous killers, they are actually shy, peaceful vegetarians. Due to massive loss of habitat and poaching these gentle, majestic primates are in great danger of going extinct. 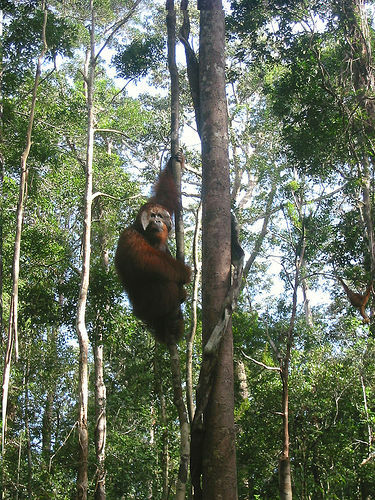 Win the “King” Orangutang in Tanjung Puting National Park. 2005 photo. Orangutans are the most arboreal of the great apes and spend most of their time in trees. Males and females differ in size and appearance. Dominant adult males have distinctive cheek pads and produce long calls that attract females and intimidate rivals. We just can’t get enough of these mixed-species buddy stories. This one features a hound dog and a swimming orangutan!